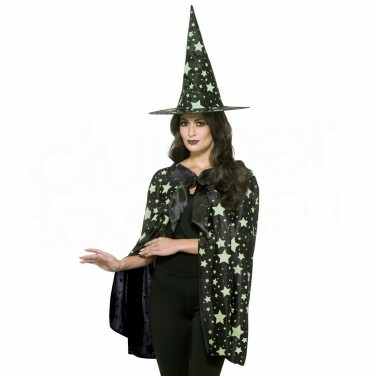 A one stop Halloween fancy dress outfit, this Midnight witch outfit contains a pointed hat and a mid length cape decorated with glow in the dark stars! A quick and easy Halloween costume, transform yourself into a spooky witch in an instant with a glow in the dark Midnight Witch kit! 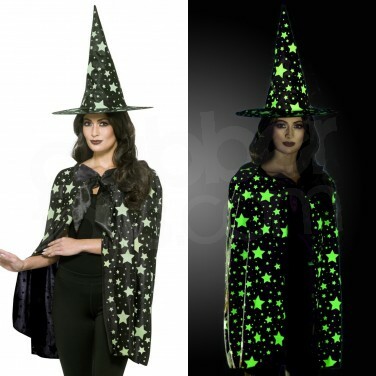 A pointed hat and mid length cape are decorated with glow in the dark stars for extra wow factor! Simply expose the outfit to light before wearing in pitch black conditions for best effects and surround yourself with glow in the dark stars as the black cape and hat fade into the darkness! Spooky! Achieve outstanding glowing looks with Glow in the Dark Make Up and Glow Nail Polish! Highlight your favourite features and create fantastic special effects that glow...great for parties!